If you remember my inspiration– I really love how Martha made a number out of her photos- but we had some issues getting them printed and they showed up as the party was starting. I threw them up on the wall (not in a 1) and we had fun looking at how much they’ve changed in the past year. They’re still up on our wall and probably will be until that painters tape gives up. The other piece of inspiration I didn’t 100% stick to is the striped table cloth. I posted about it on Friday– since the backdrop was such a statement, I went easy on the stripes and just added a couple to tie it in with the theme. Ahh guys, we ate so well at this party. And the best part? I didn’t make a darn bit of it. Except for the marshmallows- but I feel like that was more of a craft than cooking. Our family members are the best. 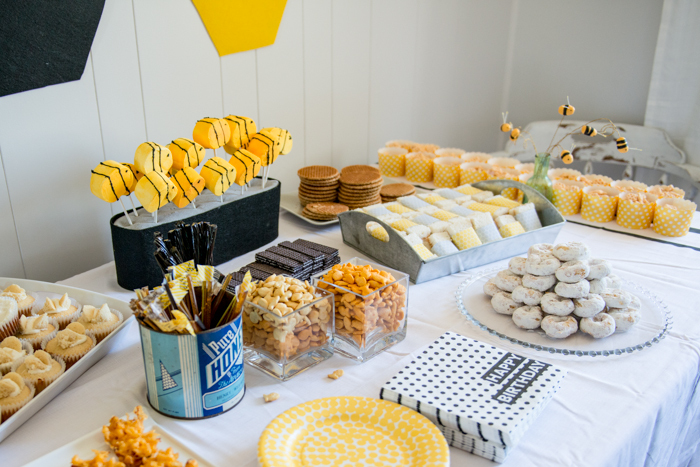 I commissioned a few people (that offered to help) to make these delicious macaroni bites but with bacon (SOOO GOOD) and the babies birthday cakes, cupcakes, and peanut butter and honey sandwiches. Oh, I wrapped the sandwiches in cute paper too… but again- craft not cook. All the other food required NO effort. I really wanted to be able to sit back and enjoy the party without worrying about food. 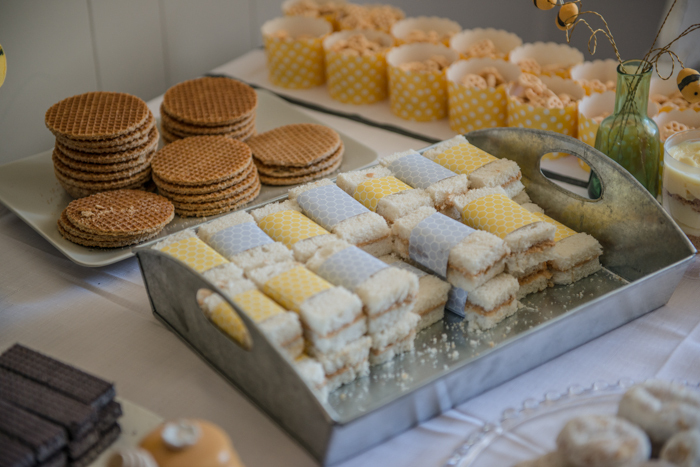 The Stroop Waffels and those chocolate looking cookies are both Dutch (just like my hubby) and they’re such a treat for us. Plus they had a sort of honeycomb thing going on so we used it as an excuse to treat ourselves. They’re not the easiest to track down here! The mini donuts, goldfish, and honeycomb cereal are all straight out of the package. 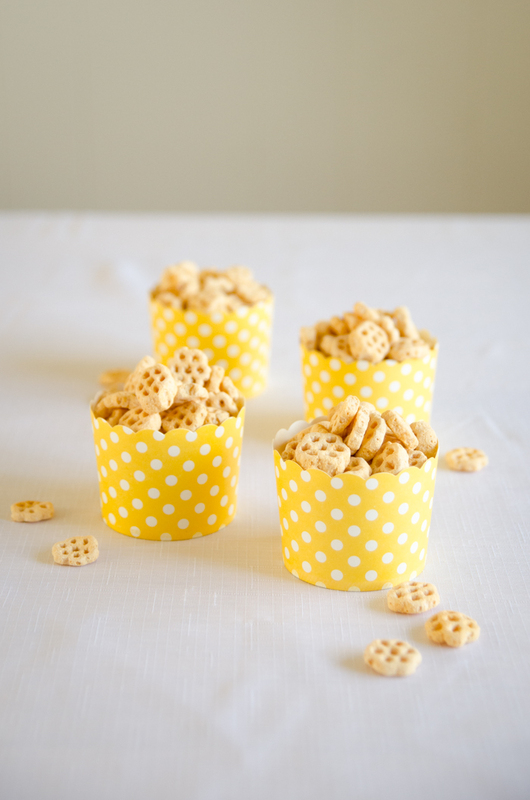 But really, what kid doesn’t love those treats? 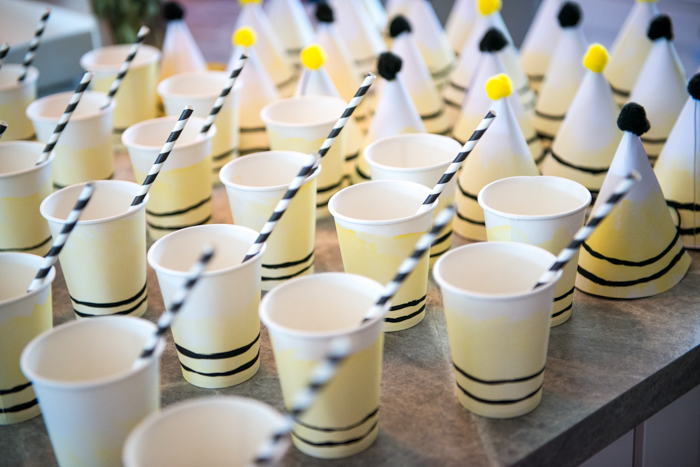 Some other details I crafted are the party cups and party hats (looove the way these turned out!) which I’ll be posting the DIY for in the coming weeks. The babes loved the hats… not wearing them, but playing with them at least! 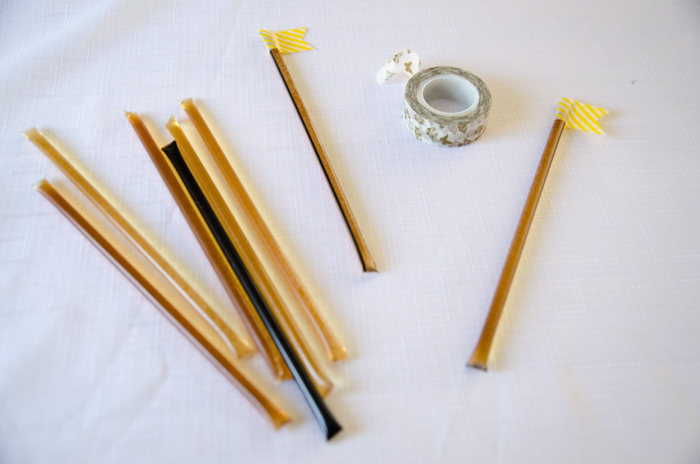 I also sourced some local honey sticks to have as favours. I added some washi tape to make them flags and wrote ‘So sweet of you for coming’ on a few of them. I still have a bunch of these that we’re working our way through. I was pretty excited when my sister-in-law reminded me I’d bought a vintage honey tin the last time we were at my favourite antique store. I had them set out in a plain old vase. 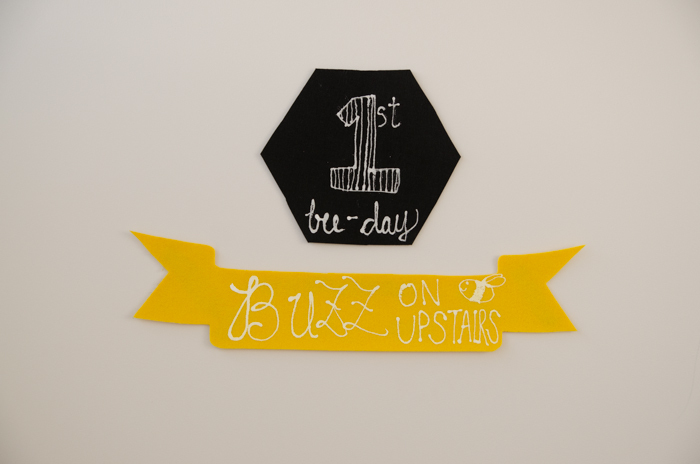 Lastly, I made some signage out of felt for the front door so we didn’t have to answer it all day- I used the same method to make these DIY Handpainted Felt Wall Banners if you’d like to make one yourself. Oh, and those little bees in the very very top photo are made of plasticine. SOO the cake smash was ridiculously cute! I chose to have them on the floor (their cake on a crate) so that they could interact with eachother instead of strapping them into their highchairs. It was a total mess by the end, but they had a ton of fun. If you’re wondering- I did ‘foodsafe’ the crate a little bit. I did a light coffee stain, then used butcher block conditioner on it. I’m not sure why I bothered, they ate half of the cake off the floor (honesty moment). Their unique personalities shone through during the cake smash, Emmitt with food all over his face and body while Aubrey would take breaks to wipe her hands off on her shirt. I have a bunch of funny photos from their first encounter with cake that I’ll cherish. And after they were all cleaned up, we got photos in front of the giant party chalkboards I’d written all their stats on. Guys, you’ll be so proud of me- I listened and went out to buy a chalk pen- those things are AMAZING! 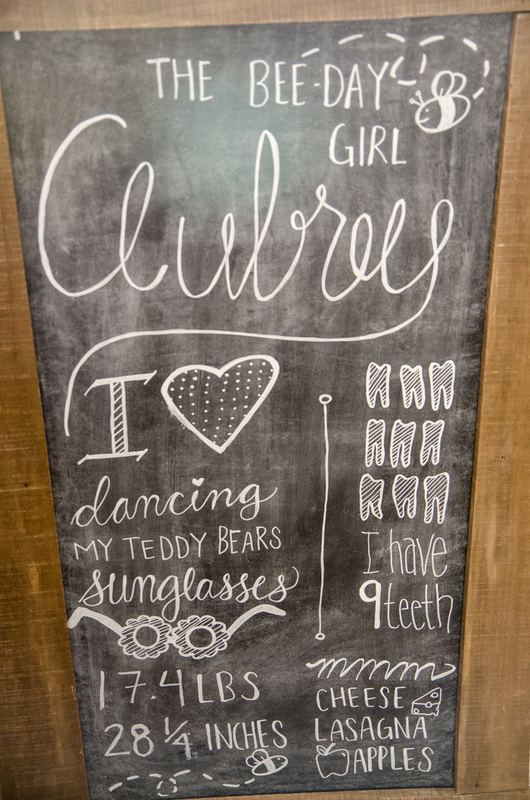 I feel like I’m instantly a better chalkboard artist. 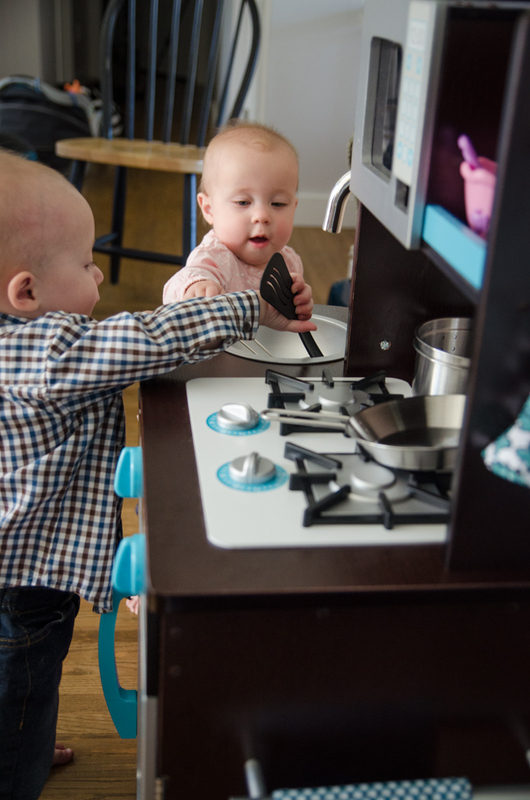 We had the hardest time keeping them in front of their chalkboards because we’d already given them their gifts- this kitchen was two feet away, calling their name. Notice that they’re holding a whisk and ladle in the pictures? 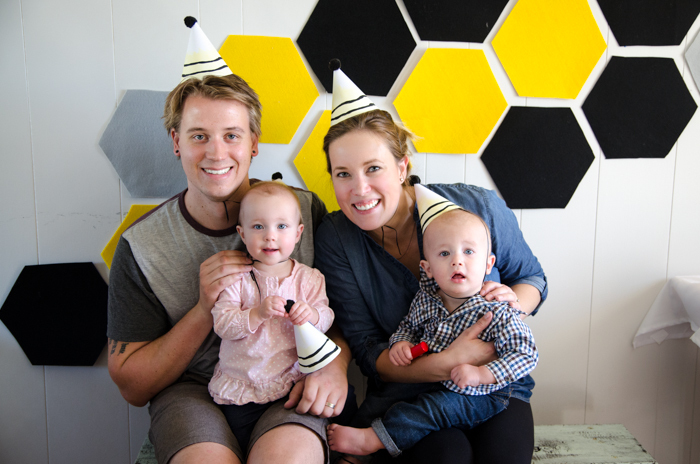 We also snapped a few family photos with our party hats- not an easy task! 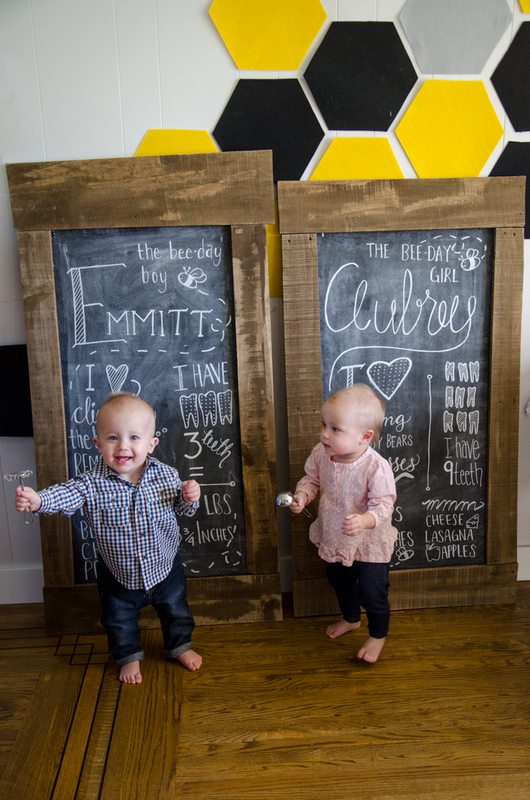 So anyways, that’s their first BeeDay (I giggle every time I say bee-day now, I just can’t stop). What do you think! Is this a theme you’d try out? For a first birthday or for your next very-much-adult birthday? Oh and since this post is uber long already, I’ll share the invite as a freebie in another post too! And the twins look like they had a blast! I love how different their stats are – especially the teeth! Except the cheese – who doesn’t love cheese, anyway? Aw, thanks Kara! They are SO different it’s crazy. Emmitt finally got his 4th tooth just today (hooray!). And I’m so on board with the love of cheese, I think you’re right- no one doesn’t love cheese. How sweet are they?!!! I love everything about this party, but that felt backdrop is AH-Mazing! It love how it turned out! So cute! 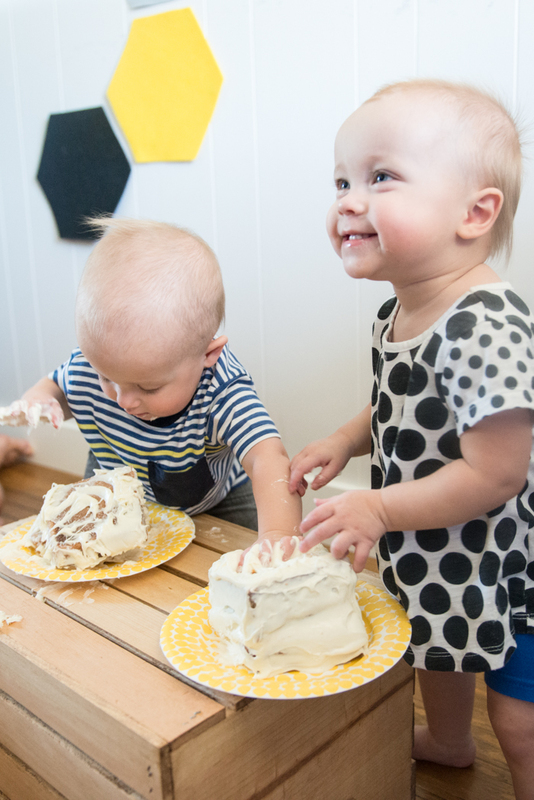 What a great way to celebrate their first birthday! 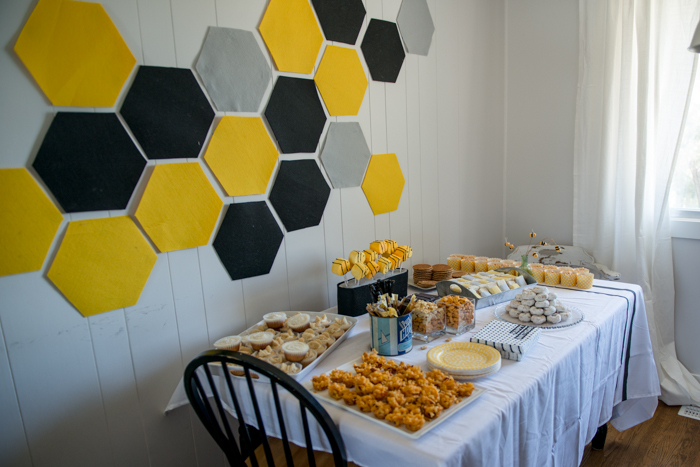 Cute photos and a lovely party theme. I like the cake eating photos best. Great memories. I have so many sweet photos from that cake smash, definitely something I wont forget :) Thanks so much for stopping by! Oh my goodness. Seriously the cutest party ever. I love the play on words and, well everything! Your babes are adorable and you must be one proud momma! Oh. My. Goodness. So cute! Pinned! Thanks so much Jenny, I appreciate you stopping by! Oh! I love this party so much! 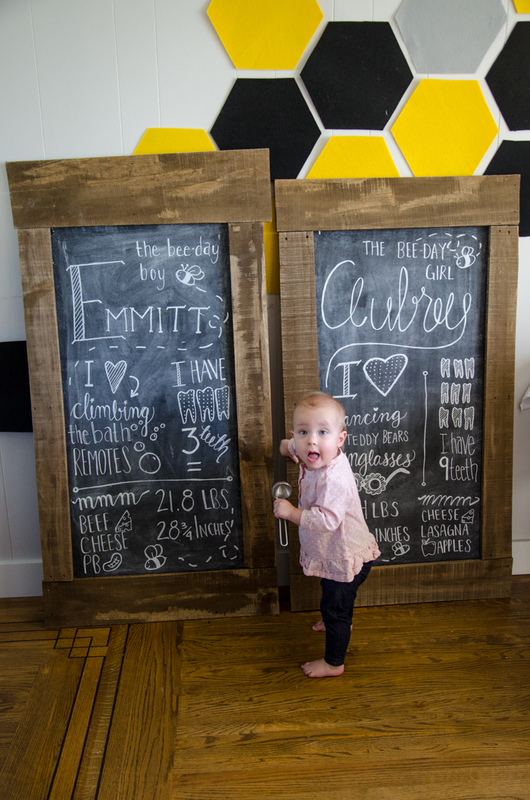 Then honey sticks and the honeycomb cereal and the chalkboards and that cute cake smash! So many great details! Such a cute party! And your kiddos are just adorable. I love the bee theme. So fun. Thanks for sharing at On Display Thursday, come again! Thanks so much Leia, I think they’re pretty darn cute myself ;) Great party as always! 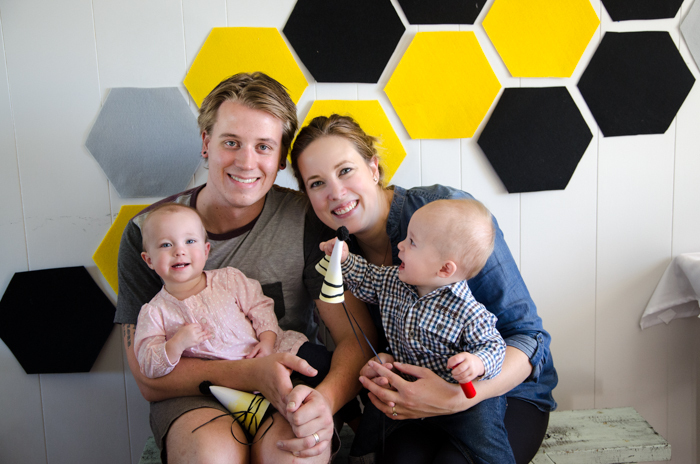 Your family is the cutest! 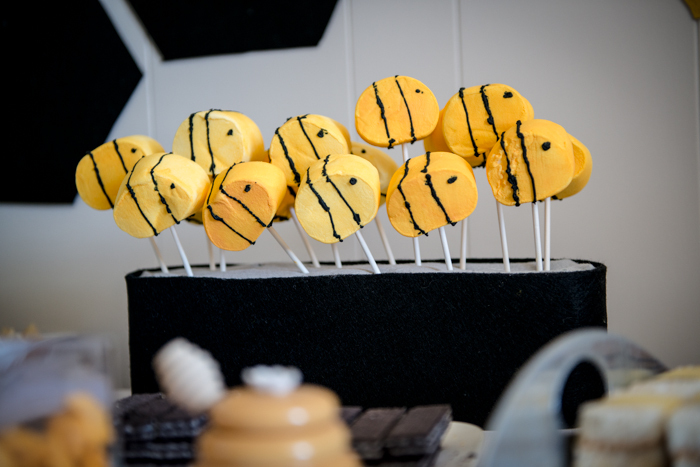 I was all for this bee-day party idea until I was stalked by real buzzing bees last week at a painting job, and now I’m not too fond of them anymore. We still have to finish the job, so I’m not done with them yet. Maybe by the time I have kids I’ll be over it. :) Your party turned out great!